UNITED NATIONS, Sep 20 2017 (IPS) - After finally breaking silence with a much anticipated address on the ongoing crisis in Rakhine State, Myanmar’s de facto leader Aung San Suu Kyi has disappointed the world as she refuses to acknowledge the plight of her country’s Rohingya community. In a 30-minute televised address, Myanmar’s State Counsellor Aung San Suu Kyi said that her government does not fear “international scrutiny” over its management of the crisis in Rakhine. Suu Kyi, who decided not to attend the ongoing UN General Assembly in New York, said she nevertheless wanted the international community to know what her government was doing. “We condemn all human rights violations and unlawful violence,” she said in her first public address since violence reignited after the Arakan Rohingya Salvation Army (ARSA) attacked security posts on 25 August. 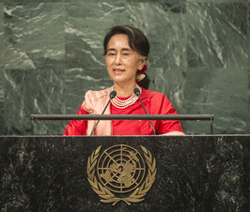 However, her speech was filled with claims considered dubious by many worldwide as she refused to address the reality on the ground in Rakhine including the military’s alleged campaign of killing and burning villages. Recipient of the Nobel Peace Prize Suu Kyi said that security forces are exercising “all due restraint” and that there have not been any “clearance operations” since 5 September. However, Human Rights Watch released new satellite imagery showing that at least 62 villages in northern Rakhine were burned between August 25 and September 14, some of which can even be seen hundreds of kilometers away at the Bangladesh-Myanmar border. Secretary-General Antonio Guterres warned Suu Kyi that she has a “last chance” to reverse the army’s offensive and if she doesn’t, the crisis will be “absolutely horrible” and may not be reversible in the future. The spike in refugees fleeing the conflict since 5 September indicate ongoing violence, which Suu Kyi also denied, stating that most Muslims have stayed in Rakhine and that the crisis is not as severe as the international community thinks. “It’s incredulous,” said head of Amnesty International’s UN Office Sherine Tadros to IPS about Suu Kyi’s statement. Rakhine State has a population of approximately three million, one million of whom are Rohingya Muslims. The UN has estimated that over 400,000 Rohingya have already fled to Bangladesh in just three weeks. They have warned that up to one million—representing the entire Muslim population of Rakhine State—could flee to the neighboring nation by the end of the year. “She has the responsibility to speak out, and at the very least we would expect for her to acknowledge what is going on in the ground in her own country,” Tadros said. Though it is unclear why she continues to support a military that placed her under house arrest for 15 years and has prevented her from becoming the President, some say Suu Kyi is walking a tightrope in protecting her own political interests. This includes keeping the Myanmar’s powerful military, known as the Tatmadaw, happy. After winning the 2015 elections, Suu Kyi and her party, the National League for Democracy, entered a power-sharing agreement with the Tatmadaw which includes control over a quarter of all seats in parliament. The military also retains control over its own budget and key ministries including home affairs, defense, and borders, making it the real power in northern Rakhine. And the head of Tatmadaw General Min Aung Hlaing has explicitly and consistently spoken out against the Rohingya community, claiming that they are illegal immigrants from Bangladesh and Myanmar cannot “accept and recognize” them. “Rakhine ethnics [Buddhists] are our indigenous people who had long been living there since the time of their forefathers,” he said in a Facebook post. Myanmar’s Buddhist-majority population have also had little sympathy for the Rohingya since 2012, when deadly violence between Rakhine Buddhists and Rohingya Muslims left at least 200 dead and displaced 90,000. It seems that Suu Kyi may be between a rock and a hard place. However, many believe that she does not only have the responsibility, but also the power to advance human rights in the country. “As the moral leader of the country and as the senior most political leader, she is certainly in a position to shape the way that people in the country think about human rights, the way they think about the situation in Rakhine state,” Smith told IPS. “She has political concerns and that is a normal thing for any leader, but the fact that the political concerns are taking precedence over the killing and injuring of thousands of people…it’s just beyond words,” she continued. “We are a young and fragile country facing many problems, but we have to cope with them all… we cannot just concentrate on the few,” she continued. Tadros said that excuse is not good enough and that she can show leadership without the state collapsing. “Myanmar has had decades to deal with the issue and has never done it in an effective way and the Suu Kyi administration is no different,” Smith said. Though Suu Kyi claimed that her government has made efforts in recent years to improve living conditions for Muslims living in Rakhine without discrimination, Myanmar’s government has long disputed the Rohingya people’s status as citizens. Since 1982 when they adopted the biased citizenship law, the country has enacted a series of discriminatory policies including restrictions on movement and exclusion from healthcare, rendering the majority of the group stateless and impoverished. However, Suu Kyi has consistently remained silent on the plight of the Rohingya and has instead perpetuated their discrimination and exclusion. When asked if this continues to perpetuate the narrative that Rohingyas are terrorists, Smith said yes. “She is in a position now to actually save lives, she is in a position now to stop atrocities. Not only is she failing to do that, but she is making matters worse,” he told IPS. He added that she is contributing to a narrative that may push more civilians to attack Muslim populations in the country. Suu Kyi said all those who have fled to Bangladesh will be able to return after a process of verification, and added that she wants to find out what the “real problems” are in Rakhine. Though there is no end in sight to the country’s crisis, Smith expressed concern that her promised actions may coerce the population to disavow their ethnic identity. “This isn’t about being able to physically cross the border to go back to your house anymore, this is about using this moment to actually get the Rohingya the rights that they deserve,” she added. She urged for Suu Kyi and the international community to do everything in their power to stop the violence, while Smith called on the Security Council to declare the crisis as a threat to international peace and security. “What is needed right now is action. The Security Council needs to start preparing itself to act towards international justice,” he concluded. Reminds me of the quote, “the slaves of today, are the tyrants of tomorrow”. The leader is from a political gentry deposed & deprived access to political power, but subsequently reclaimed the seat of power (her heritage) with intl support. Evidently, power coopts that metastasize to short memories. And very little known about her past, of tests about her critical leadership in the face of challenges befitting high moral ascendancy. Maybe the world expect too much of a persona cloaked in the image they themselves created on the basis of her gentry? A mere mirage as a rallying point against the former regime? (Were the Rohingyas better off under the military regime?) While elsewhere in the planet, voices resonate about nationalism (us vis them) vs one global community of universal dignity and humanity — why would anyone expect this part of the world or this nation in particular, to be any different? Certainly state-sponsored extremism is not a monopoly of one faith? If it were the opposite or the other way around — terrorism would be the by word. Now…are there more or less peoples dying from terrorism or genocide? .